Thank you for rejoining us this week as we continue our series, The Highest-Rated Air, Balloon, and Helicopter Tours of the Grand Canyon and Surrounding Areas. Last week, we provided you with comprehensive information about the air tour, The Top Gun and Air Combat Experience. You learned about the different adventures that you may embark on and the details associated with each of those adventures. This week, you will be presented with a hot air balloon tour and a helicopter tour. If you are ready to experience the Grand Canyon and the surrounding areas in a new, exciting, and unique way, continue reading for more information. If you would like to take to the skies in a beautiful hot air balloon that will allow you to silently and peacefully soar over the city, the neighborhoods, and the desert hot spots in and around Las Vegas, you are sure to love The Las Vegas Sunset Hot Air Balloon Ride. This 1-hour flight not only provides you with captivating views of Las Vegas, but, you will fly over the Mojave Desert and witness the beauty and mystery of Red Rock Canyon! 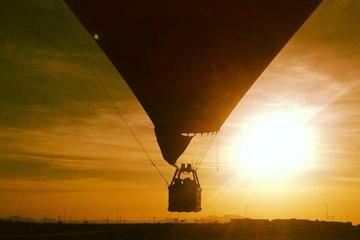 One of the best features of this hot air balloon tour, though, is the fact that the flight departs as the sun is setting. You will witness the majestic appeal of this event and find yourself awe-struck at the beauty of the sky. At the end of the hot air balloon tour, you will be allowed the opportunity to partake in a memorable champagne toast! This tour is perfect for those looking to add a little romance to their trip! If you are searching for a relatively lengthy, yet budget-friendly, tour of the Grand Canyon and surrounding areas, you should opt for the Deluxe Grand Canyon All American Helicopter Tour! This amazing flight will take you to the deepest depths of the national park, where you will get the opportunity to indulge in a delicious picnic, complete with the best-tasting champagne. While on this amazing helicopter tour, you will get the opportunity to fly low above the Hoover Dam, Lake Mead, and the extinct and mysterious volcanoes in and around the area. 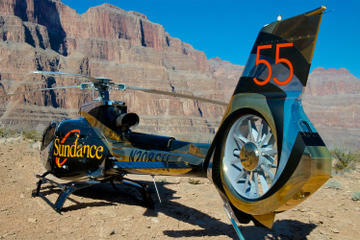 The end of the helicopter tour will take you over the famous Las Vegas Strip. This tour takes place on a highly-innovative and advanced helicopter, the EC-130. It includes a commentary by a knowledgeable and extremely entertaining pilot. When you return from the flight, a limousine will be waiting to transport you back to your hotel. You may choose from an early morning tour, a late morning tour, an early afternoon tour, or a late afternoon tour. The actual flight times may change, depending on the restrictions pertaining to the weights of the passengers and/or the weather conditions.